According to the Hebrew Bible, God made the world with words. God just spoke and the world became reality. (The Aramaic for 'I create as I speak' is avara k'davara, or in magician's language, abracadabra.) ...This does not protect words from the numbing effects of overuse in any religious tradition ...We need to dust off the words, shake away the accretions, wonder again about what they originally might have meant and enable ourselves to live in the word." 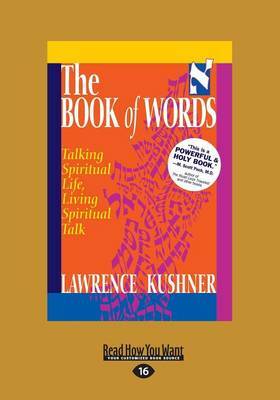 -- from the Introduction With creativity and poetry (and occasional heresy) Kushner dusts off thirty classical Hebrew words, shakes them free of the effects of generations of overuse, "re - translates" them, and liberates their ancient holy power. The result is a contemporary spiritual guide for your personal religious life. According to the Hebrew Bible, God made the world with words. God just spoke and the world came into being. Words therefore are not merely sounds signifying something else; they are instruments of creation, primary reality itself. They need only to be read, spoken, and interpreted. And to know them is to know reality itself. Kushner has designed the book himself, seamlessly blending graphics and content. In doing so he evokes the aesthetics of an ancient manuscript and a vision of our power to shape the future. Each finely crafted chapter begins with a Hebrew word and Kushner's provocative English translation. At the bottom of the page is a transliteration of the Hebrew along with its more customary English rendering. In addition to his own intriguing definition, he includes a biblical citation anchoring the word, along with a more recent text showing the word's evolution. Finally, we are offered a personal, meditative exercise designed to enable you to "live in the word."